Vertebrates constitute a specialized animal group in the phylum Chordata. The origin of chordates is considered to be an ancient animal of a tail to swim that contained a central notochord, bilateral muscle bands, and the dorsal neural tube that coordinated the contraction of muscles. 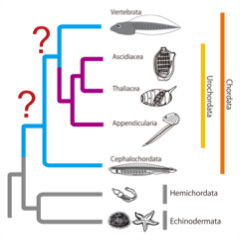 Thereafter, chordates, and later vertebrates, had invented many kinds of sophisticated traits to let their bodies more adaptive; e.g., a pair eyes, nasal pit, ear, adenohypophysis, jaw, heart, gill, blood vessels, and so on. Our research interest is on key evolutionary factors to establish chordate/vertebrate physiological and developmental traits. We are mainly using urochordate research models, including ascidians (Ciona and Halocynthia) and appendicularians (mainly Oikopleura) to perceive the original status of vertebrate physiological traits. These urochordate organisms in fact possess “simple” tail, photoreceptors, and chemo- and mechanoreceptors, and also a bit strange gill and heart. We aim to uncover the operational principles of these urochordates’ organs/tissues, and to compare them with the knowledge in vertebrates to extract the common and derived features. We are also interested in comparing developmental processes to establish the comparable organs/tissues between urochordates and vertebrates. Through such paths, we expect to unveil the evolutionary processes to establish the chordate and vertebrate bodies. Ascidians first develop into tadpole-shaped larvae, and then attach to some substrate to metamorphose into sessile adults. 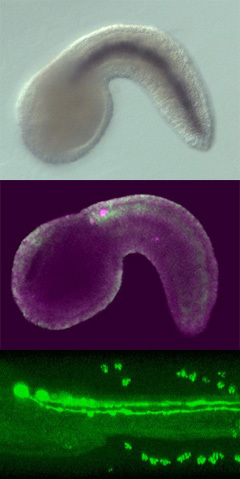 The tadpole larvae of ascidians are in general so simple; the muscle cells in the tail are counted to be invariantly 36 in Ciona and 42 in Halocynthia, and the motor neurons to regulate the muscle cells are only 6 in the motor ganglion and several in addition along the caudal nerve cord. Despite such a simple motor system, the larvae are able to fluently swim, and to change the swimming speed in response to the light they perceive by the simple eye spot. 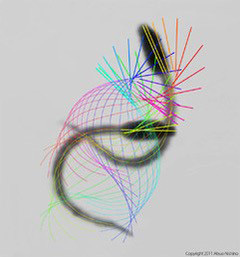 The larvae have a tendency to swim upward dependently on their gravity sensor along right-handed spiral trajectories. One of our research targets is to understand the intrinsic mechanisms for the ascidian larvae to swim with such characteristics. We expect that the swimming mechanisms of ascidian larvae may share deep operational principles with the regulatory mechanisms of vertebrate locomotion, and that those in ascidian larvae may represent an evolutionarily “minimal” principle. In addition to this project, we are also interested in other physiological processes, such as ciliary beating on the gill slits of ascidian adults, and more. 1993-1997 Undergraduate study at Department of Biology, Faculty of Science, University of Tokyo. 1997-2001 Graduate-school study at Department of Biological Sciences, Graduate School of Science, Kyoto University. 2001-2004 Assistant at Department of Integrated Biosciences, Graduate School of Frontier Sciences, University of Tokyo. 2004-2007 Post-doctoral study at Okazaki Institute for Integrative Bioscience, National Institutes of Natural Sciences. 2007-2011 Assistant Professor at Department of Biological Sciences, Graduate School of Science, Osaka University. 2012-present Associate Professor at Department of Biology, Faculty of Agriculture and Life Science, Hirosaki University. Atsuo Nishino (2018) Morphology and physiology of the ascidian nervous systems and the effectors. In “Transgenic Ascidians” Yasunori Sasakura (ed.) Springer. In press. Atsuo Nishino, Yasushi Okamura (2017) Evolutionary history of voltage-gated sodium channels. In “Voltage-gated Sodium Channels and Their Related Diseases” (the Handbook of Experimental Pharmacology series) Mohamed Chahine (ed.) Springer. In press. Shinobu Hirai, Kohji Hotta, Yoshihiro Kubo, Atsuo Nishino, Shigeo Okabe, Yasushi Okamura, Haruo Okado (2017) AMPA glutamate receptors are essential for sensory-organ formation and morphogenesis in the basal chordate. Proceedings of the National Academy of Sciences of the United States of America, 114: 3939-3944. Tatsuya Omotezako, Atsuo Nishino, Takeshi A. Onuma, Hiroki Nishida (2013) RNA interference in the appendicularian, Oikopleura dioica, reveals the function of the Brachyury gene. Development Genes and Evolution 223: 261-267. Atsuo Nishino, Shoji A. Baba, Yasushi Okamura (2011) A mechanism for graded motor control encoded in the channel properties of the muscle ACh receptor. Proceedings of the National Academy of Sciences of the United States of America 108: 2599-2604. We investigate physiological or developmental processes of several kinds of marine invertebrates. We take care of living marine animals in tanks containing seawater to keep them in this inland laboratory. We love to observe under microscopes developing embryos and lively functional cells/tissues/organs of animals. We use several kinds of microscopes for our research; dissection, differential interference contrast and fluorescent microscopes, laser scanning confocal microscopy, scanning and transmission electron microscopes. We often utilize video cameras or high-speed video cameras to record and analyze the animal movements, displacement and transformation. Molecular biological techniques are also utilized here; we are especially interested in molecular evolution of ion channel genes and isoforms of muscle structural proteins that underlies functional innovations of specific muscular or neural tissues.